What caused the “collapse” of the ancient Maya? Was there actually any “collapse” at all? This question has plagued Mesoamerican archaeologists since our first forays into the tropical rainforests of countries like Mexico, Guatemala, and Belize. In the region known as the Petexbatun in the Pasion river drainage of the Guatemalan Peten rainforest, the immediate answer for the abandonment of the sites by the political elite is obvious. 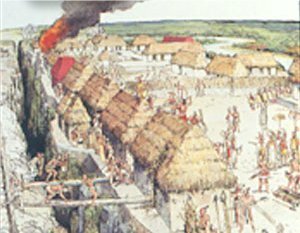 Archaeological research by the Vanderbilt archaeologists has shown that the capital cities of this region were at war – probably with each other – and that this warfare was so extreme that the cities surrounded their cores with tall defensive walls. But what caused this warfare? Did this war cause the end of the Petexbatun sites? Or was it just a symptom of some larger problem or larger shift in social, economic, and political patterns? My research on the animal remains from the Petexbatun sites revealed some intriguing answers to this problem. I used animal bones and shells as a way of looking at three different hypotheses about the “collapse” of the Maya world in the 9th century AD, particularly at the Petexbatun sites. I asked whether the cities were abandoned because the people had overfarmed their land, causing deforestation, soil erosion, and therefore competition for scarce resources. This was not the answer. I asked whether the abandonment was caused by the gradual protein depletion and starvation of the people as a result of killing off all the animals both through overhunting and through destruction of the animal habitats. Again, there was no evidence in support of this theory. So I finally asked whether there was any evidence of a more dramatic social shift that could explain the destruction of the religious-political elite class. Here I found very interesting evidence that suggests the “collapse” is better explained as a shift in economics! People in the Petexbatun area and perhaps elsewhere turned from creating glorious adornments for their religious kings to creating large numbers of utilitarian bone tools that could be traded, bought, and sold… not for the glorification of an elite, but for the maintenance of a more secular economic system. 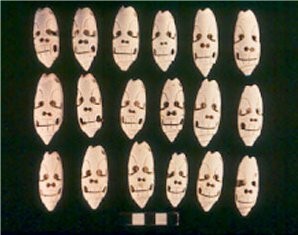 It’s a fun idea, but one that needs much more research to support the implications…that the shifts we see and have interpreted as a “collapse” are in fact simply the disappearance of one form of politics and economics and its replacement with another form, less recognizable in the archaeological record.